Super serious and brooding, Marcus hasn't got a creative bone in his sharp-suited body. For technophobe Tilly, it's a match made in hell. And yet, when Tilly discovers her fiance isn't at all what he seems, it's Marcus who's there for her with a hot chocolate and a surprisingly strong shoulder to cry on ... He might just be the best Christmas present she's ever had. Jules Wake's earliest known declaration that she planned to be a writer came at the age of ten. Along the way she was diverted by the glamorous world of PR and worked on many luxury brands, taking journalists on press trips to awful places like Turin, Milan, Geneva, Paris, Brussels and Amsterdam and occasionally losing the odd member of the press in an airport. It gave her the opportunity to eat amazing food, drink free alcohol as well as providing opportunities to hone her writing skills on press releases and to research European cities for her books. Eventually the voices in her head persuaded her it was time to sit down and write the novel she'd always talked about. Her debut novel, Talk to Me in 2014, was quickly followed by the bestselling From Italy With Love, published by HarperImpulse which reached the top ten in the Amazon Kindle charts. This was followed by From Paris With Love This Christmas and more recently, the best-selling Escape to the Riviera published by Avon in June last year. 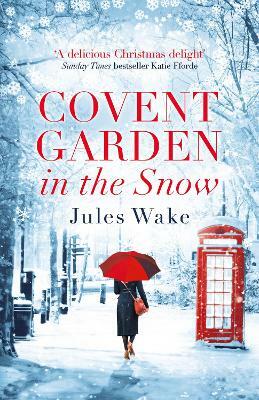 Jules' current book Christmas at Covent Garden is a Kindle Top 3 bestseller. She also writes cosy romantic fiction as Julie Caplin and her next book, The Little Cafe in Copenhagen, will be released in February 2018.